What can you see in this photograph? What type of photograph is this? How has the photographer dealt with light and colour? What is surprising/unusual/mysterious about this image? ​Does this photograph remind you of any others? Because all knowledge is assimilated to the object, as the power or genius of nature is ecstatic, so must its science or the description of it be. The poet must be rhapsodist – his inspiration a sort of bright casualty: his will in it only the surrender of the will to the universal Power. Everything in the world has been photographed. Or so it would seem. Everything visible, that is, and quite a lot which, at least to the human eye, is invisible. Yet from time to time, one is brought up short by a photograph of something one has never seen before. Of course, it’s just a question of noticing it. Everything visible in the world can potentially be seen, but noticing it, giving it due attention, that is quite a different matter. One might say that is the photographer’s primary mission – to notice and to pay due attention. I had one of those ‘never seen this before’ moments with this photograph by Peter Fraser. I have always called it ‘Two Trucks’, but its correct title is Hirwaen, South Wales. Actually I had a series of mixed emotive moments when I first viewed this wonderful photograph, firstly surprise, then bafflement and incomprehension. But these were quickly followed by pleasure and admiration as I realised that Fraser had created a moment of epiphany, that flash of apprehension, the ‘flame of recognition’, when, as James Joyce said, the ‘whatness’ of a thing is revealed. That indeed, might be another way of defining the photographer’s mission – to reveal the ‘whatness’ of a thing. The ‘whatness’ here is not easy to define at first, for the picture itself is an image of indeterminacy. In photography of serious ambition, the photographer’s subject is almost never simply the subject-matter. Susan Sontag once famously (or notoriously) remarked that ‘in photographing dwarfs, you don’t get majesty and beauty, you get dwarfs,’ but the aim of the serious photographer is generally to confound that statement. However, in Peter Fraser’s image, even the precise subject-matter is a matter for conjecture. When explained, the answer seems obvious. The photograph, shot with a strobe at night, shows the sides of two blue trucks parked together in a parking lot. The view is disconcertingly off-kilter, and there is a pattern of white spots in the pictures almost as if it was shot in a snowstorm, but this is a serendipitous illusion. The speckled pattern is too regular, and is actually spots of reflected light from Fraser’s strobe, bouncing off the rivets that hold the trucks’ sides together. The subject of the photograph, however, is another matter. 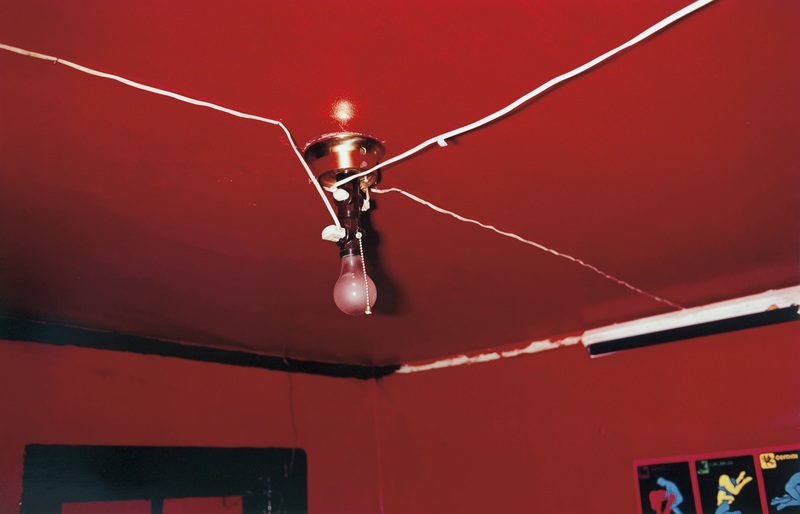 In his early career, Peter Fraser was inspired by William Eggleston. In 1984 he actually spent two months in Memphis, ‘hanging out’ with the master, and gaining in the process the best kind of photographic education, which Walker Evans defined as ‘informal contact with a master.’ In this context, Fraser’s ‘Two Trucks’, might be seen as an equivalent of Eggleston’s ‘Red Ceiling.’ That is to say, it is an important and defining early work. It shows the influence of Eggleston, but the differences between the two images are as crucial as the similarities. Firstly, whatever else it might be about, ‘Red Ceiling’ – or to give it its correct title, Greenwood, Mississippi – is about the colour red. Fraser’s trucks are blue, but the picture would not seem to be about blue. 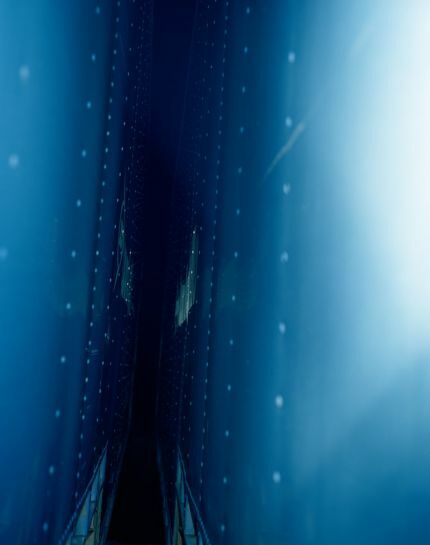 Although the blueness of the image predicates a certain psychological resonance – cold for instance – and the picture would be very different if the trucks were another colour, its metaphors derive more from its formal structure, the claustrophobic space and kinaesthetic sense, which combine to create an aura of unease, yet also a state of powerful, unseen energies. We can say that the differences between Eggleston and Fraser reflect the difference between American and European art. Eggleston is a typically American photographer in that he works through the object he is photographing, preserving its integrity as an object. Peter Fraser, on the other hand, is working around the object, looking to go beyond the object. Although, as for any photographer, the object is important, it is not of primary importance for Fraser, not as important as it is for Eggleston. Thus fairly early on in his career, ‘Two Trucks’ indicates that Fraser has established an interest in making allusive photographs. However, the general tenor of the allusion in his oeuvre becomes clearer only after he has made a number of bodies of work, and even in the present series, the meanings in Fraser’s imagery is by no means as fixed as it is in other photographers, especially those with more fixed and with more external socio-political points to make. Although his work has been a progression through various projects, Fraser has tended to begin afresh each time, although, as Jeremy Millar has rightly pointed out, ‘one should not confuse visual disjunctions with conceptual ones.’ Nevertheless, the nature of Peter Fraser’s enquiry is not only intensely personal, it is also exploratory and experimental. But of course, Fraser’s interest is perfectly natural, as photography itself is essentially about material – the stuff of life. Photography was invented during an age when a strongly materialist viewpoint prevailed in European society. Throughout its history, the medium has been utilised much more to present a ‘scientific’ rather than an ‘artistic’ trope. And even when put at the service of art, the strong fantasist strain in photography, frequently seems a reaction to the medium’s endemic materialism. ​In PETER FRASER, Fraser continues his exploration of the overlooked object. The objects that have attracted his attention here are a disparate lot. They range – to pick a few at random – from two pine cones, a shard of blue glass stuck in mud, a paper aeroplane, to a drinking glass stuck behind a metal table leg. Fraser seems to be testing Hazlitt’s famous contention that ‘all things by their nature are equally fit subjects for poetry.’ Apart from the fact that many of them could be incorporated into any assemblage installation in any contemporary art gallery there seems little correlation between them of the face of it. One point can be made however. Seen in an art gallery, this collection of objects would seem rather commonplace. Assemblages using ‘trivial’ and ‘undignified’ objects, unless made by the order of a Joseph Beuys, have largely lost their power to shock or surprise nowadays. And although many photographers photograph similar objects to Peter Fraser, there is an element of surprise, even shock, in the suite of images shown here. To find a reason why this should be so, means investigating the connection between these disparate objects. And any connection would appear to be metaphysical rather than social, although clearly these objects and materials exist in the social sphere, and are part of the social fabric of our lives. Moving from the realisation that, although photography was supreme in depicting the materiality of an object, Fraser realised that for the ambitious photographer, this was not enough. To photograph an object – say a paper aeroplane – and in so doing label it as such, goes only so far. Going further means evoking Greek metaphysics again, such as the combination of eternal principles Pythagorus saw in all objects, such as limited and unlimited, one and many, at rest or in motion. When a photographer actively seeks to evoke these qualities in an object, and then attempts to suggest its location in both space and time, as when Fraser alludes to the cyclic nature of things, the more complex is his awareness of an object’s identity and being, and also of its interdependence upon other objects. Eventually, we return to Heraclitus and his theory that the constant flux of the universe is a dynamic unity of all opposites, a perpetual opposition between life and death, which are unified through the dynamic transformation of opposites into each other. From the contradictory union of opposites derives the notion that things can be known only through their association with other things. A tree, for example, is known as a tree because there are other things – plants, animals, timber products – to differentiate and define it. If there were only large trees, one would not know small tree and so on. And from the basic concept of ‘tree’ derives a matrix of complex relationships that eventually would encompass the whole world.